The Sternbräu is – like the “Sound of Salzburg Show” itself – full of history. Located right in the center of the city next to the famous “Getreidegasse” shopping street, the building is one of the oldest sites in Salzburg. Mentioned first in the year 1542, the walls witnessed many people come and go. One of those people was Wolfgang Amadeus Mozart, who liked to come here regularly (especially in the year 1777). What started out as a brewery in the Middle Ages evolved over hundrets of years into one of the biggest restaurants in Salzburg. At the beginning of 2013 the most ambitious rebuilding phase in the history of Sternbräu began. After almost two years the restaurant re-opened with a modern face and a special culinary heart. The Sound of Salzburg Show takes place in the “Festungssaal” hall on the first floor. The room kept all of it’s traditional Austrian looks, combining it with the typical Sound of Music spirit, that one can enjoy during the show. 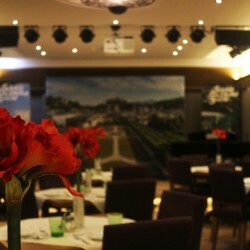 An optional Austrian dinner can be ordered before or after the show. Maximum capacity: 74 guests. Do you want to know more about the Sternbräu? Check out the detailed Information about the venue.